Bill's Gamblin' Hall & Saloon will be closing on February 4, 2013 to undergo an extensive renovation and transformation into a luxury boutique hotel. "The complete remodeling of the guest rooms, casino floor and common areas, the addition of a new second floor restaurant, and the construction of the 65,000 square foot rooftop pool and dayclub/nightclub." 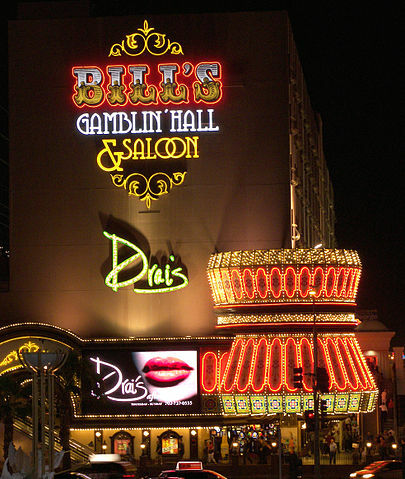 Ever since Caesars acquired the former Barbary Coast in 2007, they've had plans to do something with it. At first they were thinking about demolishing it along with Flamingo and Imperial Palace to make room for their version of CityCenter. When the economy tanked they scrapped that idea and settled for modest renovation projects. I'm always in favor of property improvements, but it's going to be sad to see Bill's go. It was always a fun place to stop in for cheap drinks and low table minimums, just like O'Sheas. Those two closing leave Casino Royale as the premier low rolling joint on the Strip.